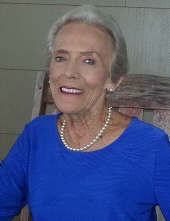 Jessie Rae (Jet) Seale passed away at the age of 83 on January 20, 2019, in Bryan, Texas, surrounded by her daughters. Jet was a loving wife and mother, and a caring, compassionate friend to all she met. Jet was born on July 20, 1935, in Leona, Texas to James Ray and Mary Ruth (Easterling) Sandel. On June 6, 1954, she married the love of her life, John T. “Bub” Seale. Jet and Bub built their home and their life together in Flynn, Texas. They raised 3 daughters: Joni, Jana, and Jill. Jet worked for many years as a secretary at Normangee ISD and then at the Leon County Special Education Cooperative. She loved gardening with Bub. She loved cooking for her family. She loved her church and her community. She was truly happiest when she was caring for someone. Jet was preceded in death by her parents, James Ray and Mary Ruth (Easterling) Sandel; her husband John T. “Bub” Seale; her sister, JoAnne (Sandel) Keeling; brothers, Kenneth Sandel and Tommy Sandel. She is survived by her daughters: Joni Seale of Leona, Jana Seale Cox (David) of Flynn, and Jill Seale (Marina Douenat) of San Antonio; grandchildren Sarah Cox, Will Cox, Hunter Cox, and great-grandson Evan Cox, all of Fort Worth. She is also survived by sister-in-law Sandy Sandel of Centerville and a host of nieces and nephews. The family would like to give special thanks to the many wonderful caregivers at the Carriage Inn where Jet lived the last years of her life, and to the caregivers of Hospice Brazos Valley for their support and compassion during her final days. A funeral service will be held 3:00 p.m. on Thursday, January 24, 2019, at Walters Funeral Home, 610 S. Commerce St., Centerville, Texas. A visitation will be held Wednesday evening from 5:00-7:00 p.m., also at Walters Funeral Home. Internment will be at Evans Chapel Cemetery, Leon County Texas. In lieu of flowers, the family respectfully requests donations to the Alzheimer’s Foundation of America or Hospice Brazos Valley. To send flowers or a remembrance gift to the family of Jessie Rae "Jet" Seale, please visit our Tribute Store. "Email Address" would like to share the life celebration of Jessie Rae "Jet" Seale. Click on the "link" to go to share a favorite memory or leave a condolence message for the family.